Creed, Mission, Vision and Values. and want to achieve in the future. Provide beauty care that adds a richness to people’s lives that enables them to live beautiful, healthy lives. Aim to be a first class 100-year company. To help everyone with whom we are involved (including our employees) increasingly prosper physically and psychologically, and by so doing contribute to the advancement of society so that we can pass on a more prosperous society to the next generation. In the same way that the present is the result of past efforts, the future is created by the efforts that we make starting today. We give thanks to our founder and other pioneers for their efforts, and look down the years into the future as we act today. Altruism Seek the well-being of others with gratitude and kindness. Self-Discipline Seek improvement through self-discipline and tackle new challenges while attempting to live in harmonious prosperity with your surroundings. Empathy Try to experience everything yourself, and develop empathy by describing your experience in your own words. as a major pillar supporting the management philosophy. External beauty involves the development of cosmetics that serve to build healthy skin while enhancing the skin’s own natural healing abilities. Working with extremely high standards regarding its products’ raw ingredients and the way in which they are used, Faith has developed a line of cosmetics that do not produce active oxygen, which are known to cause aging of the body’s tissues. The company is also developing a line of slimming lingerie for creating beautiful bodily proportions. Internal beauty focuses on guiding the body towards a state of superior health by increasing the effectiveness with which its own systems function. Two examples of products that help to beautify the body from within are growth-ray emitting products and health foods, which offer health benefits ranging from anti-oxidation to constipation relief. Spiritual beauty refers to the creation of beauty by achieving balance in the autonomic nervous system and maintaining the mental emotions in a relaxed state at all times. It is not the prospect of temporary relief but rather the continuing promise of the benefits of relaxation that Faith offers to women suffering stress caused by the disruptions imposed on the autonomic nervous system by our tension-filled society. 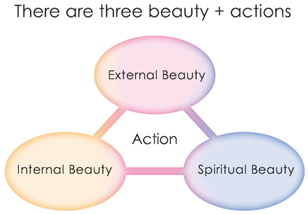 Healthy beauty as conceived by the Faith Group is achieved by putting into practice and acting on the three facets of beauty—external, internal, and spiritual.